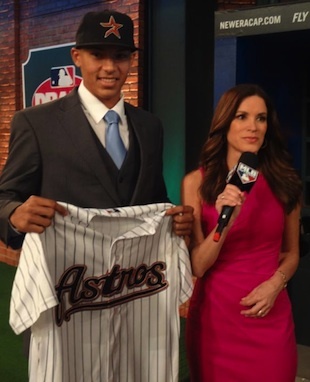 BAseball Reality Tour: ICYMI, Last Night was Draft Night! The grammar police are taking the night off. There's not much form here, just free flowing notes I took down during the first night of the 2012 Rule 4 Draft. The rumors of Carlos Correa potentially dropping to the Cubs at #6 were greatly exaggerated. Mark Appel getting abused by his college coach, Mark Marquess, didn't help. This feels like a great moment for the Twins. They wanted Buxton. How far will Appel drop? The Mariners need hitting. I'd expect the Orioles to take him, as they always need more pitching. Byron Buxton: "I'm glad I'm a Twins now." Mike Zunino, catcher from U of Florida to Seattle. Makes sense. Leader behind the plate and very good hitter. The O's are up, then KC, then my Cubbies... Starting to get nervous. Wow, Kevin Gausman over Mark Appel! While some people are whispering about his signability, I feel more like this drop must be due to concerns over Appel's wear and tear. Royals take Kyle Zimmer, RHP from the University of San Francisco. Holy crap! What if the Cubs take Appel over Albert Almora. As a fan, I would not like that. He's slipping and the Cubs don't need anyone with question marks, picking 6th in the midst of a 105-year Championship drought. Phew, thank goodness, the Cubs took Albert Almora. That's a relief. He's not at the level of someone like Matt Kemp, but he could develop into someone like Adam Jones, or hopefully better. Max Fried, LHP to the Padres. Hmm, they always need hitting and can't attract free agents to that ballpark. Conversely, plenty of pitchers would love to induce fly balls at Petco. Appel to the Pirates at #8. We're only hearing the drop is due to signability, not the fact that his coach, Jim Riggleman, err Mark Marquess, had him throw over 140 and 120 pitches in games this Spring. Andrew Heaney to the Marlins. A LHP should help that club. Plus, the TV guys are projecting him to be a guy who could help out as a LOOGY right away. If they're in the race, he could be a late-August, or Spetember, call-up. Ozzie Guillen was the manager in Chicago, when the White Sox called up Chris Sale in the same situation. Courtney Hawkins sporting Sammy Sosa hair shave lines, nice look. He just did a back flip without warming up. I'm not even a White Sox fan, and I was nervous that he would hurt his back pulling off a stunt like that while ice cold and wearing business attire. Harold Reynolds is really bad. He has been contradicting himself in mid-sentence, starting off with one point of view and ending the sentence with the opposite opinion. It's like he has dementia, or something. Still, we should be careful what we wish for. MLB Network still employs Mitch Williams, Dan Plesac, and Kevin Millar. If I may humblebrag for a second, I'm really pleased that I called the Giolito pick by the Nationals. I fealt lke they are the best up-and-coming team in the Major Leagues, and they can take the risk of this guy with a questionable elbow. He's only 17, and even if he needs surgery, which is unlikely at this point, he should be fine in a few years. He has top of the draft talent and could help the Nationals dominate the NL East in the middle of this decade. Cory Seager seems like a move the Dodgers would make. They probably lead the league in Major League legacies with a 40-man roster that includes Tony Gwynn, Jr., Scott Van Slyke, Dee Gordon, Ivan de Jesus, Jerry Hairston, Jr. I think I'm missing someone. Anyway, as most of you know, Cory's brother Kyle is on the Mariners. Bud Selig: "The San Francisco Giants select Chris Stratton, from Mississippi State University, Mississippi State, Mississippi." What a buffoon. At times, I feel like Bill Hader, of Saturday Night Live, is doing his best Selig spoof up there. Marcus Stroman video clips show him end his pitches in a terrible fielding position. He's walking towards the 2nd baseman, expecting a strikeout before the ump calls it. That should be corrected, and he looks like he's got good stuff. People are divided as to whether he's a starter or reliever. Cardinals' pick at #23, James Ramsey's comp is Skip Schumaker. The studio host, Greg Amsinger, says "Ichiro meets Dustin Ackley." I don't even know what that means. Then, Peter Gammons says he gets compared to Tim Tebow. Oh, god. The unintentional comedy is through the roof. Did you see that ad for the Chore Buddy? It's a device that reminds you to take out the garbage. I mean, really, is it that difficult to remember? And, if so, aren't there other remedies already at your disposal? Can't you set your cell phone alarm? We need Joe Posnanski's take on this one. 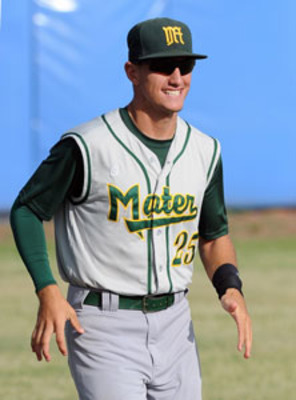 Devin Marrero, ASU shortstop to the Red Sox. Good glove, poor stick. Comp is Stephen Drew, who's a better hitter than fielder. So, that's a comp fail. Hearing the guys in studio, it sounds like the Red Sox drafted a goalie. Last pick of the first round, Brian Johnson to the Red Sox at #31, sounds terrible. Bad stats, and his highlight reel lacks, um, highlights. His player comp is Joe Saunders, who stinks. Johnson could get better, if he ignores hitting to focus on pitching. The best I'd see him become is a #4 starter or decent LOOGY. Kevin Plawecki, at #35 to the Mets, sounds really good. A catcher with a high BA, outstanding contact skills, and looks like he has a projectable power body. Stephen Piscotty looks pretty good, too (Cardinals #36). Joey Gallo, great power, needs better contact, should be good value for the Rangers at #39. If he makes it to the big leagues, his ballpark will obviously help. at #41 could be the steal of the draft. Jeff Luhnow is owning this draft. At #41, they take Lance McCullers, Jr., someone who was being looked at in the early 20's. They'll need to sign him, though, as it sounds that they won't get another compensation pick next year if he goes to Florida. With their second pick of the night, the Cubs take Pierce Johnson, a RHP, Missouri State. Got a plus FB and plus CB. Player comp: Drew Storen doesn't sound right, since Storen was picked around 15th in a better draft. To the Pirates at #45 is Barrett Barnes. His player comp is Marlon Byrd. I'd be so pissed if I were him, or a Pirates fan. The MLB Network comps Keon Barnum with Ryan Howard. It looks like them mean RyHo minus 50 lbs. Jose Valentin's son, Jesmuel, was drafted by the Dodgers at #51. Interesting if he will sign or attend LSU. At #54, the Phillies took a guy with a 3.96 GPA. He'll have nothing in common with Jonathan Papelbon. Walker Weickel has an 89 mph fastball, and comped with Jered Weaver. No way. Paul Blackburn is a 6'2" RHP committed to ASU. He may not sign with the Cubs, but the Cubs are more attractive than the average team. Just as Theo Epstein. Steve Bean sounds and looks like a hick. If he drinks and drives, he'll be perfect for the hay seed Cardinals. In the team's words: "He can be a pretty impactful offensive player. … He's a guy who pretty early became a target for us.'' — Jason McLeod, senior vice president player development/scouting. The skinny: Johnson has two plus-pitches with a mid-90s fastball and a plus breaking ball... he could move quicker if he's used as a reliever. The skinny: A Northern California high schooler who shot up the draft rankings with a strong senior season, Blackburn has a fastball that sits in the low-90s. 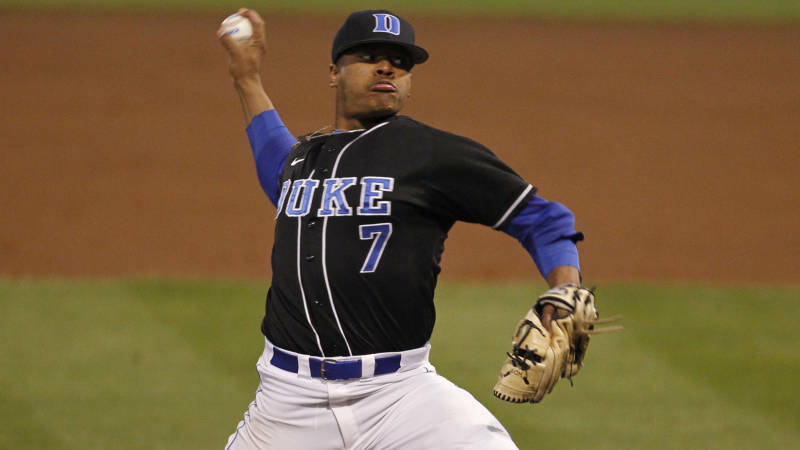 That's his best pitch now, but his curveball and changeup show promise, making scouts dream of a three-pitch package that will allow him to start. He's a good athlete with a clean delivery. 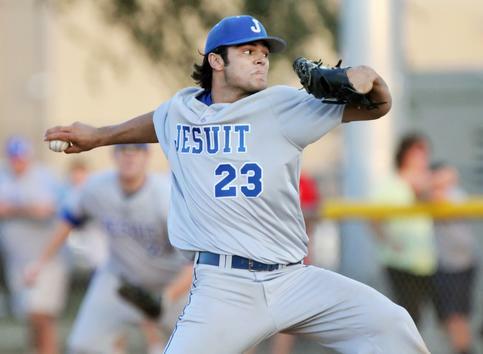 He shows advanced feel and poise for a high school pitcher. He reportedly had been targeted by the Yankees.